I can gladly make any original custom work such as the portrait of a bicycle or a cyclist or anything for your special event or team. Starting price for a 16" x 20" it's $800. For a 24" x 36" or 30" x 30" it's $1,500, 30" x 40" it's $1,800, 36" x 48" it's $2,800 etc. 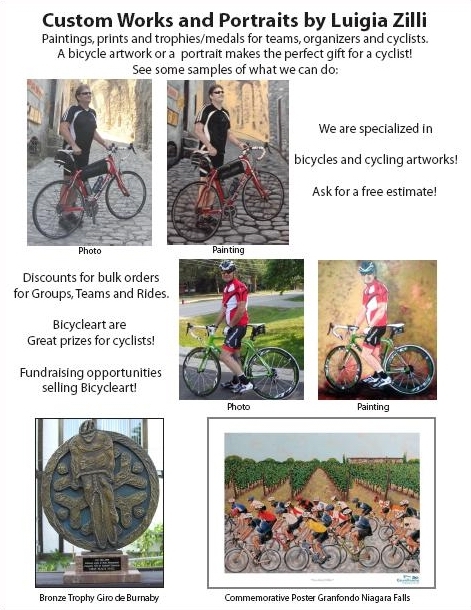 I can also personalize any print in stock with writing on the bottom the name of your cycling event or anything you'd like for a commemorative artwork. Contact us for more info or for an estimate. Get a custom painting from a professional artist who has been in the fine art industry for more than two decades and with a pretty long experience in exhibiting and making custom works for happy customers!